When firing up or downhill, an uncorrected aiming point results in a high shot. The shooter must hold less elevation than the same shot fired across level ground. Knowing how much higher the bullet will impact becomes increasingly important as the distance to the target is increased, or as the angle becomes steeper, or both. David Tubb's Distance Reduction Indicator (DRi), quickly and accurately indicates this "Hold Closer" distance and allows the shooter to determine the Effective Hold Point (EHP) to make an accurate shot. The DRi is usable at any realistic distance. The DRi eliminates the need for cosines as well as angle measurement. 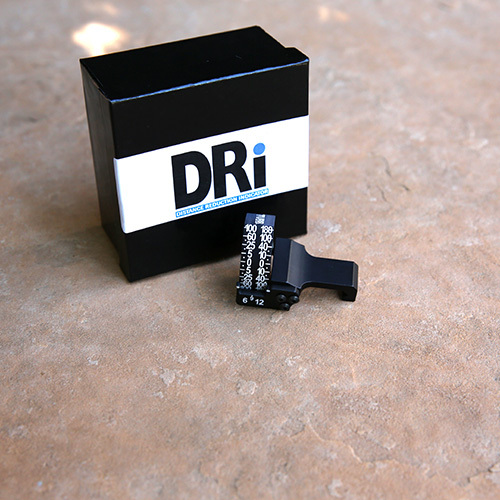 The DRi is compact and rugged. It's engineeered to be low-profile and constructed to withstand the rigors of field use. The DRi fits any standard Picatinny rail, and is level-adjustable over a 100-moa range to accomodate long-range-style scope mounts. 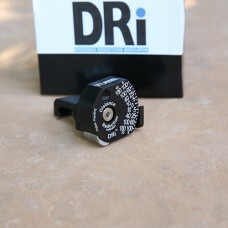 With laser engraving along the side of the dial the DRi is also readable from the spotter's perspective. The DRi base is marked with "6" "9" and "12". These numbers correspond with 600, 900, and 1200 yards or meters. The DRi is equally accurate using yards or meters. 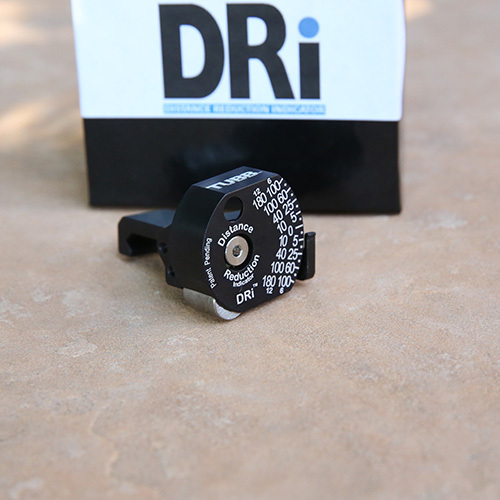 The DRi dial has markings that correspond with the Distance Reduction markings on the base. The "6" and "12" have numeric values, the "9" splits the 6 and 12 values and is used to average/interpolate. The large numbers on the dial indicate the hold-closer distance in yards or meters. 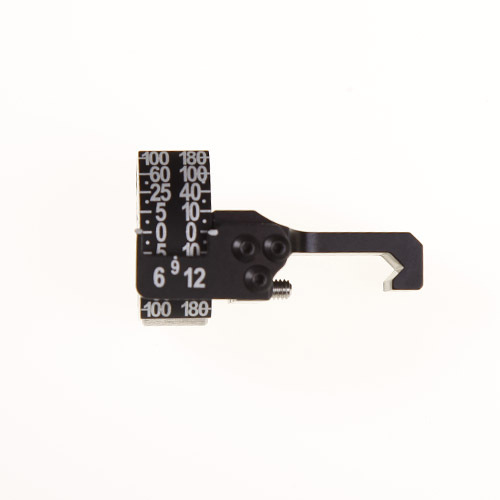 Mounted correctly, the user can acquire the DRi and then reaquire the sight with a minimum of movement. 1) Determine the straight-line distance to the target. 4) When you have determined the correct EHP, locate the appropriate aiming dot within the scope, or adjust the scope knob. 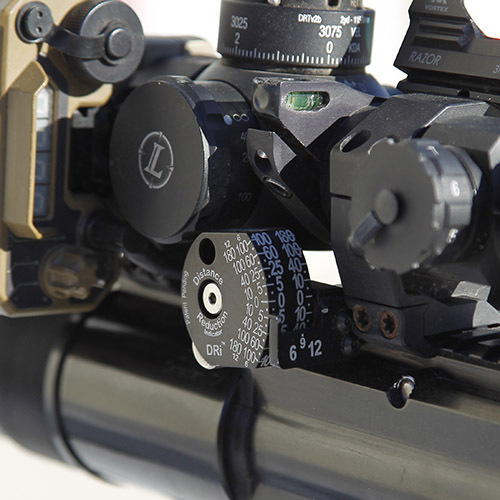 Rifle mounted "angle indicators" and "cosine indicators" are on the market to determine the Effective Hold Point (EHP). "Angle indicatos" give their answers in degrees of angle (ex. 10°) which then must be input into the user's ballistic card/data program to determine EHP. "Cosine indicators" give their answers by allowing the user to read a percentage (ex. 96%). The shooter then multiplies this percentage by the target distance to determine the effective horizontal distance to the target. That all takes time and, in the case of the cosine calculation, it's not very accurate at longer ranges. The DRi eliminates the need for angle measurements and cosines. The calculations are simple, and the inputs are fast, direct, and accurate. Under stress and time pressure, the DRi provides the fastest, most accurate angle firing solution. We recommend positioning the DRi so it is easily visible from the shooting position. This improves efficiency in reading the DRi and reaquiring the scope. The DRi is complete and ready to go out of the box!!! Click on this link to view the DRi manual.